Arrange the six islands in a circle in any order. Place the Captain Flint and Ben Gunn pieces on the islands that feature their images. Have the Ben Gunn piece face the clockwise direction while the Captain Flint piece faces the counter-clockwise direction. Three Players: Two treasure tiles on every island. Four Players: Three treasure tiles on every island. Five Players: Put four treasures on two islands that don’t have the Ben Gunn and Captain Flint pieces on them. Put three treasures on all of the other islands. Give each player one set of colored pirate cards. All sets of pirate cards not used are returned to the box. Choose a player to start by any way chosen by the players. 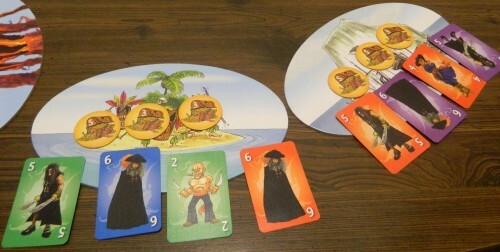 On a player’s turn they play one of their pirate cards on one of the islands face down. If there is already a face down card on that island that card is turned face up. If the card that is flipped over is the cannon, flip over the card played face down. Both the cannon and the card that was just flipped over are removed from the game. The blue player has played a card on the island. The green card is flipped over and revealed to be a canon. The green and blue card are removed from the island. If a player plays a card on an island where one or both of the pirate pawns are located, the pawns that are on the island will move. Captain Flint moves one island counter-clockwise. Ben Gunn moves one island clockwise. Play continues with each player taking turns playing a card to an island until one of the end game conditions are met. The game ends when either all of the players have played all of their cards or the Ben Gunn or Captain Flint pawn return to the island that they started the game on. All of the treasure that is on the island occupied by Captain Flint is discarded. No player will score points from that island. Captain Flint ended up on this island. This island scores no points for any of the players. Starting with the island clockwise of the island occupied by Captain Flint, total up the numbers of each player’s cards on the island. The player with the highest total gets to take the most valuable treasure on the island. The second highest player gets to take the second highest valued treasure and so on. 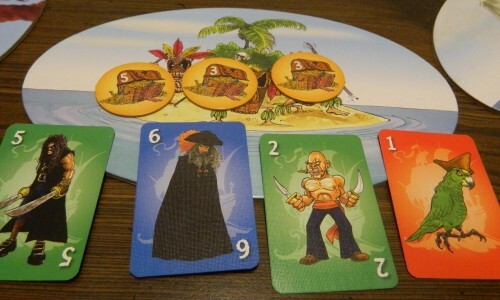 If there are treasures remaining on the island after everyone who has played cards on the island has taken a treasure, the remaining treasures go to the player with the highest total. On this island the green player has seven points, the blue player has six points, and the red player has one point. 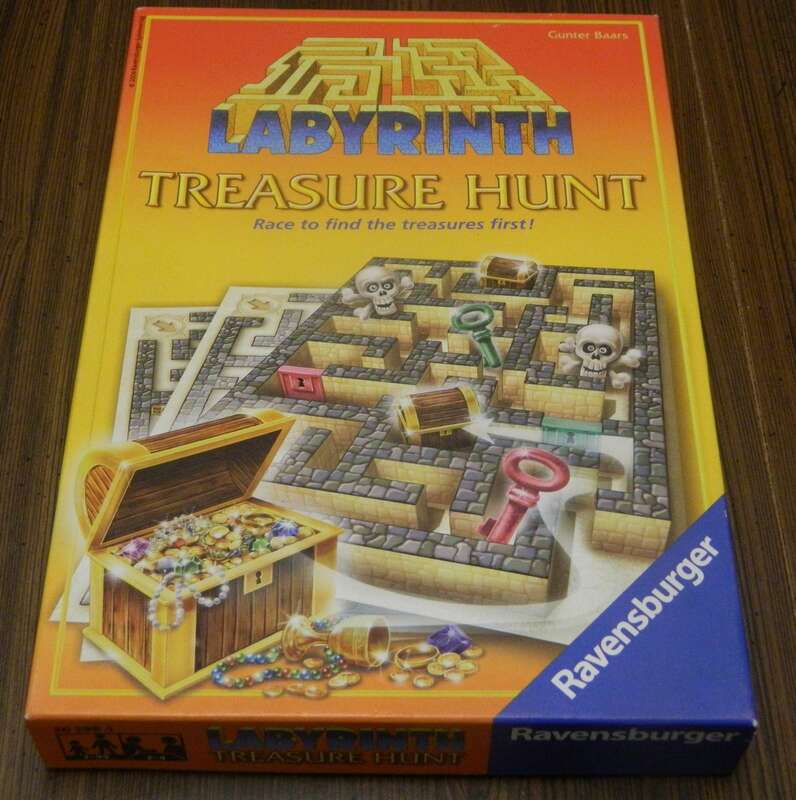 The green player would take the five treasure. The blue player would take the first three treasure. The red player would take the last treasure. For the island that the Ben Gunn pawn ended up on, the pawn is worth 10 points and counts as the highest valued treasure for that island. The token goes to the player with the highest total. The second highest total would then take the highest valued token. The green player has the most value on the island so they would get the Ben Gunn pawn which is worth 10 points. The blue player would get the five token. The red player would get the first three token. The green player would get the final three token. If two or more players have the same total on an island, the tie is broken by the totals on the previously scored island. The player with the highest score on the previous island breaks the tie. If there is still a tie or none of the players had any cards on the previous island, players look at the island before that to break the tie. On the left island there is a tie for second place. To break the tie you look at the previous scored island. Since blue has no cards on the previous island, red will break the tie and place second on the left island. After all of the islands have been scored, players count up the values of their treasures. Whoever has the most valuable treasures wins the game. The game has ended. The top player has scored 19 points, the second player has scored 22 points, the third player has scored 12 points, and the last player scored 17 points. The second player has scored the most points so they have won the game. If two players have the same value of treasure, the totals on the last island scored are compared. The tied player that has more value on the last island scored wins the game. If there is still a tie, players look at the previous island until the tie is finally broken. Over the years I have played so many Reiner Knizia games that I have gotten quite familiar with what to expect out of a game made by him. Generally I like his games. They aren’t always my favorite games but you can usually expect to get at least a very solid light to moderate strategy game. Dead Man’s Treasure is such a Reiner Knizia game that if I had played the game without knowing who the designer was my first guess without a doubt would have been Reiner Knizia. 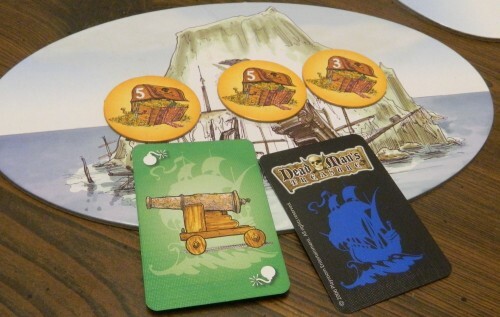 Like with most Reiner Knizia games, Dead Man’s Treasure is a light to moderate strategy game. The game is easy to learn and might seem simple at first but it still has more strategy than you would expect. I like this level of strategy in games since they are accessible enough for children and non-gamers but have enough strategy to keep gamers interested since the game doesn’t rely entirely on luck. The main mechanic in Dead Man’s Treasure is a semi-blind bidding mechanic. In the game players play cards to the different islands in order to try and get the highest total so they can claim the highest valued treasure. I call it a semi-blind bidding game since when you first play cards to an island players won’t know what card you have played. When more cards are played to the island though, previously played cards are revealed so the player who played the most recent card will know their true standing on the island while the other players need to guess the value of the last card played. 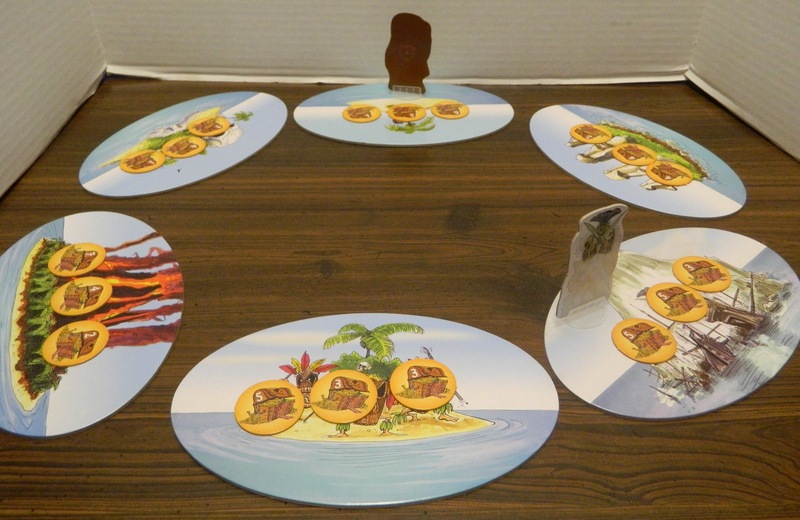 The bidding mechanic is interesting because each island is not winner take all. Unless only one player plays cards to an island, the player who has the highest total will not take all of the treasure. They will only take the highest treasure and any remaining treasure. This means that the distribution of the treasures on an island can be quite important. If an island has two five treasures and a four treasure there isn’t a lot of motivation to have the highest total if three people bid on the island. The top player will get the same number of points as the second player and only one more point than the third place player. In this situation you really only need to be one of the three highest players in order to get close to an equal value as the other players. On the other hand an island that has a seven treasure and two one treasures has a significant advantage of getting first on it since you will get a lot more points than the other players. Generally it is probably best to use your most valuable cards to claim islands with a huge difference between the most valuable treasure and the other treasures. A twist to this bidding is the presence of the two pirates. Where the two pirates are located at the end of the game can have a big impact on who will win the game. Ben Gunn is really valuable and you want him to land on an island that you control. Captain Flint on the other hand can ruin your entire strategy. The final locations of the two pirates are likely to have an impact on who ultimately wins the game. The pirates are interesting because you might have to play a card to an island that you otherwise wouldn’t have played on just to move them to another island. They also can have a big impact on how long the game lasts since if they are regularly moved a game can end quite quickly before all of the players have been able to play all of their cards. The first game that I played lasted until all of the players had played all of their cards. The second game ended quite abruptly when one of the pirates returned to the island they started the game on. You really need to pay attention to how fast they are moving around the board because you might have to drastically change your strategy if it looks like the game is going to end early. The final twist for the bidding is the presence of the cannon. The cannon can be a very valuable card if played on the right island at the right time. Since the cannon discards the next card played on the island, players are never sure that they are safe to play one of their valuable cards on a island with a face down card. Losing one of your valuable cards to a cannon has a good chance of losing you the game. The cannons can be pretty weak though if they only take out a weak card or one of your own cards. If a player is sneaky though and plays the card in a way to trick a player into playing one of their high valued cards on it, you can do a lot of damage to that player. As a light to moderate strategy game, Dead Man’s Treasure is a pretty good game. If you like Reiner Knizia games I think you will enjoy the game. I think Dead Man’s Treasure is a middle of the road Reiner Knizia game. 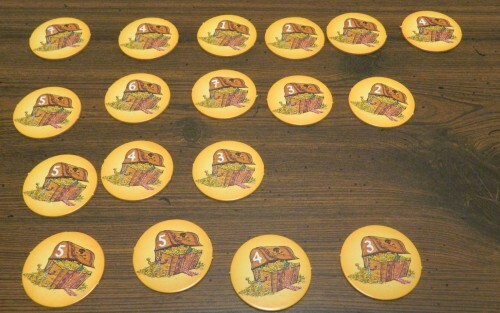 I have played better Reiner Knizia games and I have played worse Reiner Knizia games. 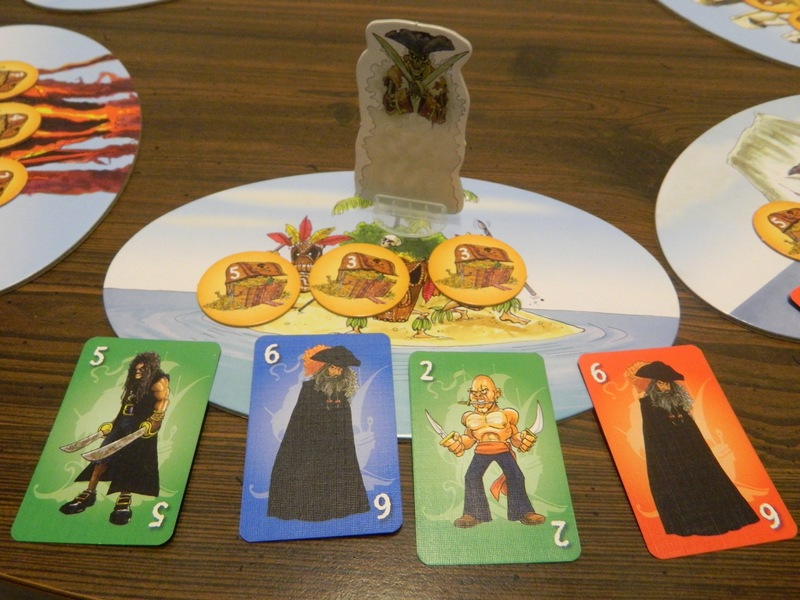 Dead Man’s Treasure is only an average Reiner Knizia game because of a couple of issues with the game. The biggest problem with the game is that you can’t really control your fate that much in the game. You can come up with a good strategy but because of luck or because of the other player’s moves it can be ruined due to no fault of your own. It is too hard to predict what is going to happen in the game. You don’t know what the other players are going to do so you really can’t plan out what is going to happen in the game. Towards the end of the game you can see a little more of what is going to end up happening but you still are never sure since one move by another player can move one of the pirates and ruin your whole strategy. This ultimately means luck will likely have an impact on who wins. If you don’t mind just playing a game and seeing who ends up winning this isn’t much of an issue. If you like to micromanage every part of the game to improve your chances of winning this might be a turnoff for you since your fate in the game is pretty reliant on the other players in the game. Adding to this are the tiebreaking rules which I don’t really like. While you can slightly plan ahead for the tiebreakers, there is too much to factor in especially since you won’t be sure where Captain Flint will end up so you don’t know where the scorekeeping will start. The tiebreaking system seems to give unfair advantages to some players. In one game a player was in three ties and they lost all three tiebreakers. I think the game could have used a better tiebreaking system. Maybe the player who first played a card to the island should break the tie since it would reward a player from committing to an island earlier. I also felt that the game is kind of on the short side. The game has an estimated playtime of 20 minutes but I think that is a little high. I would say that the game is closer to 15 minutes long. Being short is not necessarily a bad thing. Each game feels more like a round than a game though. I think the game would be better if a couple games/rounds were played and the player with the highest score after all of the rounds would be the winner. I think this would be a better rule since it would let bad luck balance out a little more so skill/strategy would have a little more impact on who wins the game. You could easily add this rule to the game so it really isn’t that much of an issue. If you are looking for a good theme, Dead Man’s Treasure isn’t going to give it to you. 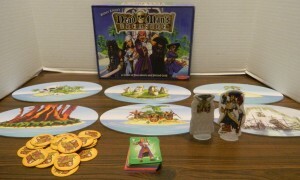 Dead Man’s Treasure uses one of the most popular board game themes, pirates. 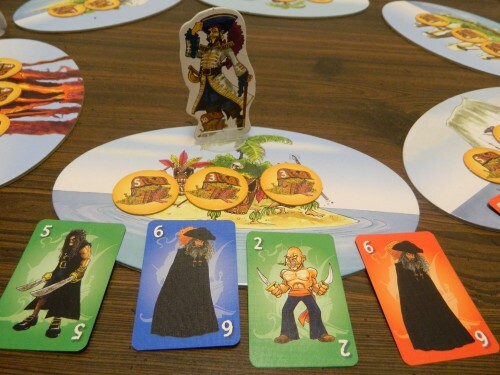 I like a good pirate theme but there are so many pirate themed games that it is hard to stand out with regards to theme unless you do something new with it. Dead Man’s Treasure’s theme feels kind of pasted on. Reiner Knizia makes good board games but I have never found his games to have particularly good themes. Most of his games feel like the gameplay was designed first and a theme was then chosen to fit the gameplay. This is actually how I prefer games to be made since I find the gameplay more important than the theme. This means though that Reiner Knizia’s themes are generally pretty average and rarely are a reason to buy his games. This is the case with Dead Man’s Treasure as well. The theme is not bad or distracting but isn’t a good enough reason to buy the game even if you like pirates. The game’s components are pretty good for such a cheap game. The cardboard used in the game is quite thick. The card quality is pretty good. Despite finding the theme to be very average, the artwork is quite good in my opinion. The artwork is colorful and well done. The artwork might make the game look like it is mostly for children, but is still very nice. I would say that Dead Man’s Treasure is a good but not great Reiner Knizia game. I had fun with the game and I like that the game has some strategy while still being accessible for children and non-gamers. The bidding mechanics are pretty interesting and give you some interesting decisions deciding which islands you want to pursue. At times it feels like you don’t have a lot of control over your fate in the game though and the theme is also kind of thin. 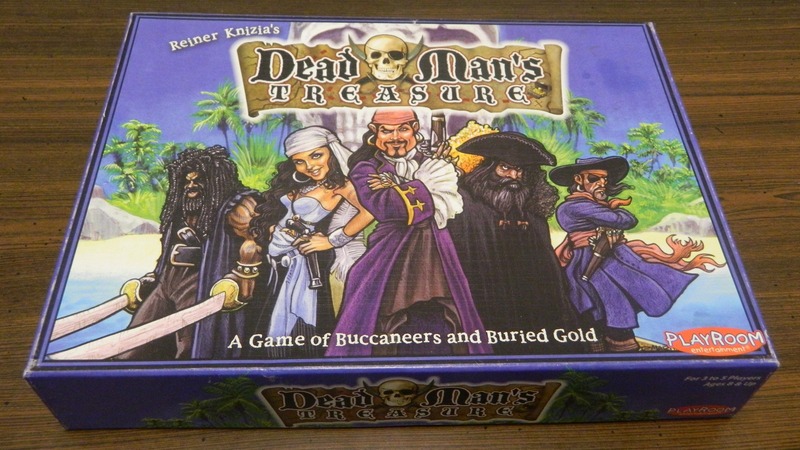 If you don’t like Reiner Knizia games I don’t think you will like Dead Man’s Treasure since it plays a lot like your typical Reiner Knizia game. If you are looking for a light to moderate strategy game that is quick and accessible or you typically like Reiner Knizia games I think you should like Dead Man’s Treasure. At its really cheap price online I think it is worth picking up. Is quick and easy to play but still has enough strategy. A prototypical Reiner Knizia game. Sometimes it is hard to plan out a strategy since things can change quickly. The theme is a little light.